More U.S. kids are being taken to emergency rooms with serious allergic reactions, new insurance data shows. The number of children treated in emergency departments for anaphylaxis went up 150 percent between 2010 and 2016, the report from Blue Cross and Blue Shield finds. Most of the life-threatening reactions are to foods such as peanuts and tree nuts, according to the claims data. It might be because parents are more aware, said Dr. Trent Haywood, chief medical officer for the Blue Cross Blue Shield Association. “Parents are recognizing symptoms, calling their pediatricians and coming to the ER a lot quicker,” Haywood said in a statement. The findings echo a report published last year by FAIR Health, which found private insurance claim lines with diagnoses of anaphylactic food reactions rose by 377 percent from 2007 to 2016. It found half of adults with food allergies developed them after the age of 18. Blue Cross dug into medical claims from 9.6 million kids covered by its policies. Those claims showed that trips to the emergency room for allergy rose from 1.4 per 10,000 children in 2010 to 3.5 per 10,000 children in 2016. The report also found that 53 percent of all anaphylactic reactions were due to unspecified causes — perhaps foods but also possibly bee stings and insect bites. About 5 percent of U.S. children have food allergies, according to the National Institute of Allergy and Infectious Diseases. Blue Cross said 18 percent of children covered by its policies had an allergy in 2016. The National Academies of Sciences, Engineering and Medicine has complained that there is not enough data about food allergies. “Gaining knowledge about a child’s allergic symptoms and specifics around the anaphylaxis health condition allows parents to take steps to keep their children safe from harm — and out of the emergency room,” the report reads. In 2016, the average ER visit for anaphylaxis cost $1,419, with an average patient out-of-pocket cost of $373. 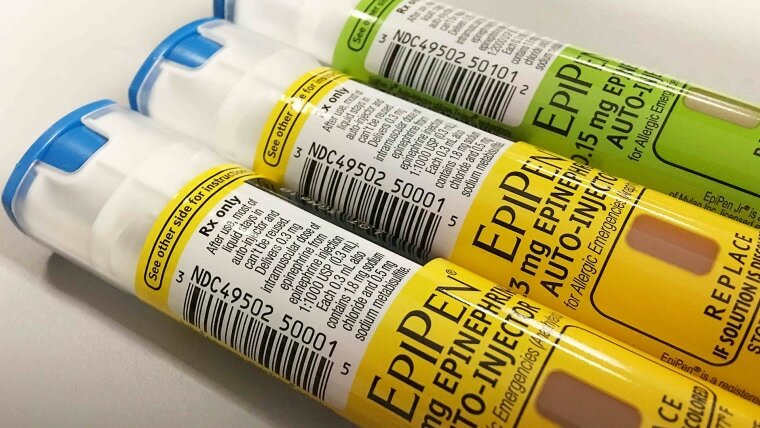 Blue Cross said the price of epinephrine auto-injector medications has come down since the controversy over the hike in the price for Mylan’s EpiPens. EpiPens cost $129 for a two-pack in 2010 but Mylan raised the price to $645 in 2016. The price is now down to $493 on average for a twin pack, Blue Cross said, and a generic Adrenaclick costs $234. The Blue Cross also breaks down allergy reports by state. Montana, Idaho, Utah and Vermont had low rates of kids with allergy-related runny noses; Oklahoma, Alabama, Kentucky and West Virginia had the highest rates.